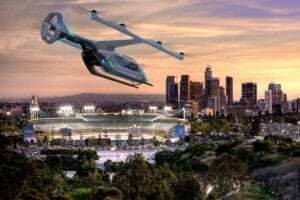 Volocopter, formerly known as e-volo, will validate the ability of its electric-vertical-takeoff-and-landing (EVTOL) air taxi to operate within Singapore’s inner city environment in 2019. The German startup company Volocopter’s fully electric VTOL aircraft is powered by 18 electric drives operating on high-capacity batteries. The aircraft made its first flight in Germany in 2016. 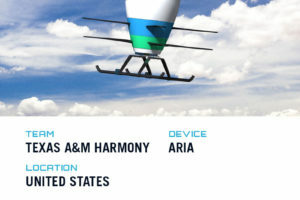 Volcopter's EVTOL features no combustion engine and can be flown autonomously or with a pilot in the cockpit using 18 rotors. It is capable of transporting two passengers up to 18 miles. Intel’s Falcon 8+ commercial drone flight control and sensor technology provides the navigation system for the Volocopter EVTOL. The software provides automated corrections of the aircraft’s center of gravity to help stabilize its position while flying. Volocopter developed all of the other avionics internally. Volcopter Head of Public Affairs Fabien Nestmann made the announcement about plans for flight testing in Singapore during a speech at the Summit of Urban Mobility in Paris Oct. 18. The company has partnered with the Civil Aviation Authority of Singapore (CAAS) and Ministry of Transport to facilitate the flights which will occur in the second half of 2019. “We are getting ready to start implementing the first fixed routes in cities,” said Volocopter CEO Florian Reuter. Volocopter flights in Germany have been sanctioned by the country’s civil aviation authority with a preliminary permit since 2016. The company is also working with the European Aviation Safety Authority (EASA) to obtain a full commercial license, but has not set a timeline on actual certification and entry into service. EASA published a draft version of proposed special conditions for certification of VTOL aircraft Oct. 15 and is seeking comments from industry before publishing a final version. 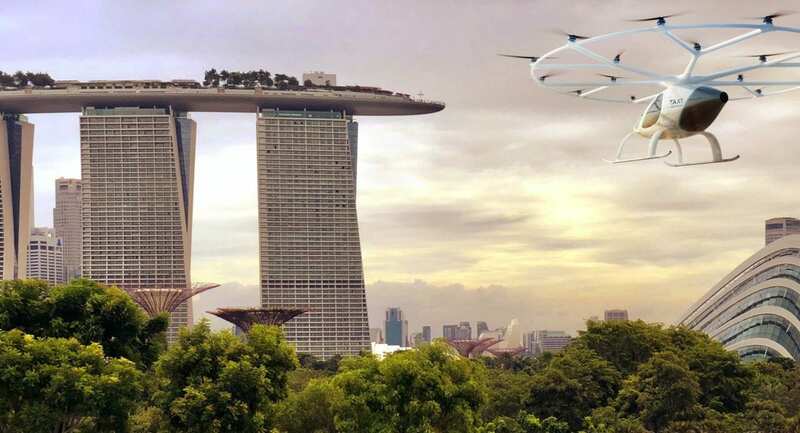 The Singapore flight tests are designed to validate and verify the ability of Volocopter’s EVTOL vehicles to operate in Singapore’s urban environment and will feature public demonstration flights. CAAS is working with Volocopter to define the scope of the flight trials and establish a set of noise requirements that must be met before the trials can take place. Volocopter claims that the aircraft “cannot be heard over the typical background noise of a city” even at a low flying height of 330 ft.
Singapore’s Economic Development Board worked with Volocopter to establish a local product design and engineering team that will participate in the flight trials as well. 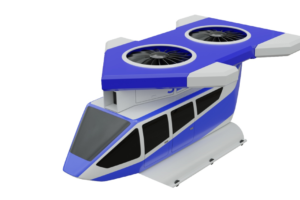 Volocopter’s goal is to eventually establish rooftop Voloports where passengers can board and de-plane their personal air taxis. In pursuit of that goal, Volocopter is seeking to partner with real estate developers and mobility providers to establish infrastructure that can support the flight testing. 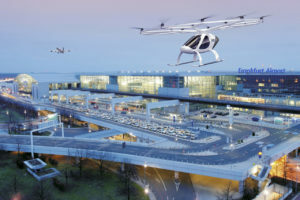 “For example, a big shopping mall complex that would like to add a Volocopter-hub on top of their mall or a big business that has its offices in a skyscraper and wants to add a Voloport for their employees to fly directly to work — Mobility providers could be anything from a maps provider to telecommunications provider,” a representative for Volocopter told sister publication Avionics International.